As summer vacation comes to the end, students around the country head back to school. At Mercy Multiplied, school is customized to accommodate each resident’s situation. Bebe was one of these girls. She came to Mercy after struggling with self-harm and attempts at suicide. She had been adopted from Haiti after being born and raised in a Haitian orphanage for 12 years. Instead, Bebe’s dad suggested Mercy. Bebe applied with the hopes to find freedom from her life-controlling issues. Little did she know that she would also walk away with her high school diploma. At first, Bebe was behind in school and simply wanted to catch up to be able to return to her high school to graduate with her class. She worked closely with Collins to create an educational plan. Prior to Collins’ five years of dedicated service to Mercy, Collins worked in public education as a teacher for 17 years and as a school counselor for 17 years. She now leads Mercy’s Education Program, which is recognized by the state of Tennessee as a Category 4 school and is a member of TANAS (Tennessee Association of Non-Public Academic Schools). Collins works with Mercy residents, who do not have a high school diploma, individually to come up with a customized education plan. This can include taking classes online, continuing courses from the high school the student is currently enrolled, taking the HiSet (the state of Tennessee’s version of the GED), or other options. “It’s my passion – knowing that I’m helping. Not only the teaching capacity of it, but the outreach to girls in need that have struggled with a lot of stuff, including school,” said Collins, who came out of retirement to work at Mercy. In Bebe’s case, Collins helped her to see that she could not only continue courses to stay on track, but that she could actually complete her schooling while at Mercy. “When girls come to Mercy, there’s a lack of motivation because of the frustration of everything they’ve gone through and trying to keep up with school,” said Collins. “But, I actually find that when the residents start being successful here, they start to relax and start to feel like they’re accomplishing something. Then they start feeling better about school and about themselves,” she said. Bebe recently graduated from the Mercy program, and within that special ceremony, Collins also presented Bebe her high school graduation cap and diploma. 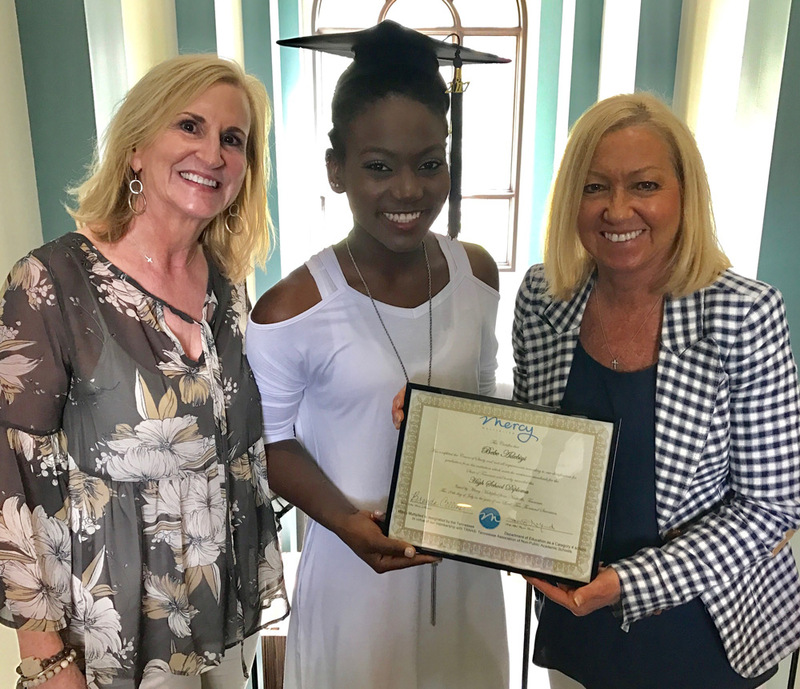 It was an extra special presentation in that Bebe was the second graduate to receive her diploma through Mercy Multiplied. Beyond Mercy Multiplied, Bebe plans to join the Army. “Now I want to live life and live it to the fullest,” she said. “One of my favorite parts about my job is knowing they can come here and go to school, and I can be a part of helping them acquire what they need until they get in a better place,” said Collins. To learn more about Mercy Multiplied’s residential program, including its education component, please click here. Read about another Mercy resident who achieved her High School Equivalency Diploma (HiSet) here.